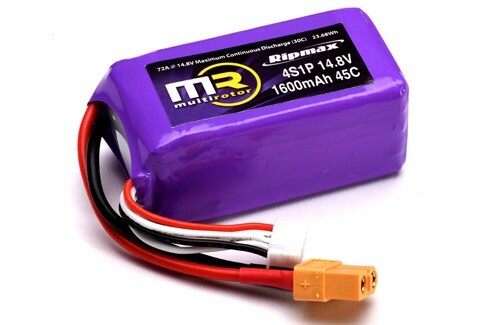 The Ripmax MR 4S 1600mAh LiPo battery is ideal for all small FPV racing drones due to it's high 45C rating, this compact sized lightweight LiPo battery is a great match for pilots looking to explore higher speeds and more power. If your system can handle a 4 cells LiPo this is a quick and easy performance upgrade solution. This battery delivers upto 72 amps of continuous current, allowing you to get the best performance from the motors on your mini FPV racing system. Supplied with an XT60 connector and JST XH for the balance lead, this battery is instantly compatible with most systems and chargers on the market without modification.